The summer always seems to go by at the blink of an eye. And the thought of going back to school isn’t something many students look forward to. But changing your mindset is easy to do. Going back to school is a great excuse to load up on cute school supplies (Check out Pencil Box Factory! ), brand new clothes and of course – backpacks. 2D BAGS was voted by the Huffington Post as the #1 backpack for back to school for girls. Below are our top picks to make you really stand out this school year. This is one of our most popular backpacks. And there is a good reason. It’s cute and it stands out. If you love pink, this is your backpack. One thing we hear a lot about our 2D BAGS is that you can’t fit a lot of items. However, although that is true for a lot of our shoulder bags, our backpacks are quite roomy. Check out the video below to see how much the Pink 2D BAGS Backpack can actually hold. If you love stripes, this back to school backpack is for you. This cute orange, blue and gray combination is perfect to match any accessories you have with these colors. Orange sneakers anyone? If your mission in school is to save the world and join every charitable after school club possible… then the Peace 2D BAGS Backpack is for you. This backpack is cute and makes a bold statement. So you like the play games huh? Our Arcade Backpack is the one for you. Hopefully you keep your books and calculator (does anyone even carry those around anymore? ), instead of your video games in here. Welcome to our boxiest backpack. This backpack isn’t huge, and you may not be able to fit your laptop in here. But hey, carrying too many books isn’t good for your back! What you lack in space more than makes up in style and fun! This backpack isn’t as roomy as our other backpacks. But to store your ipad, a notebook and some pens, this backpack is perfect. 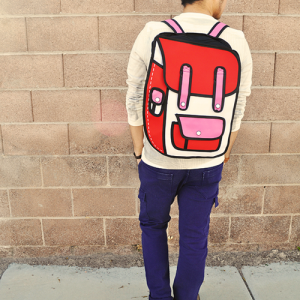 Super cute and super portable backpack. 2D BAGS wants to make your school year special. What backpack is right for you?